Comfortable, fully furnished mobile hotel towers and rooms for interesting travel destinations. 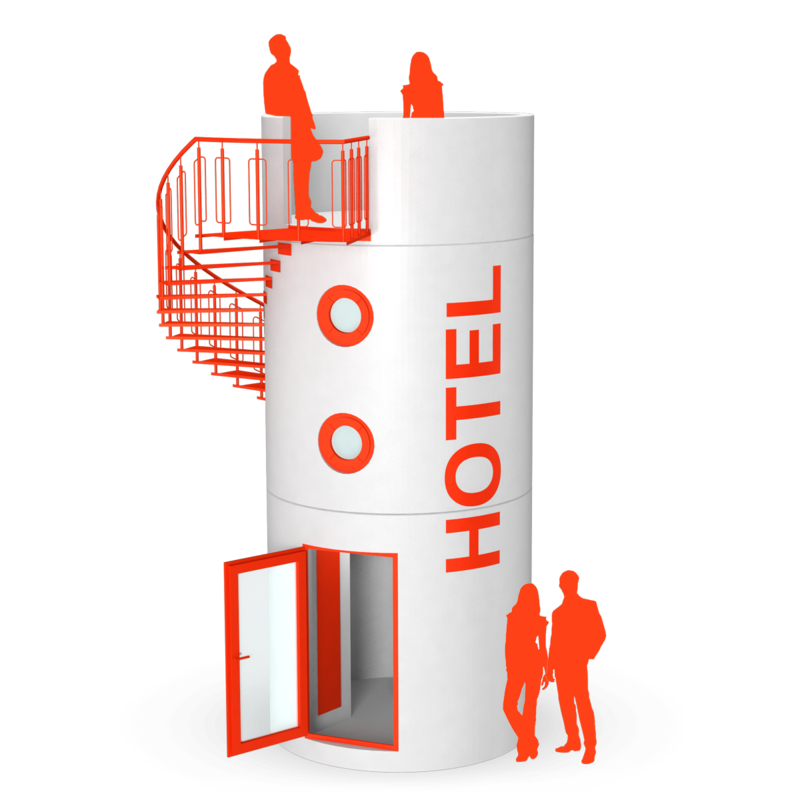 Veloform’s product range bboxx Hotelt Tower includes fully furnished, solid rooms and towers for hotels, hostels, camp sites, amusement parks, recreational areas as well as private use in residential areas. This cylindric mini-building provides a comfortable, elegant alternative to containers. The unique tiny houses are equipped with private roof terrace, living room and bathroom. They also work as attention getter alongside existing buildings. Hotel lobby, sanitary facilities, tecnical room, store room and home office complement the bboxx hotel towers and mini hotels. Check out the newest edition called bboxx slube home. Solid and durable, for outdoor and indoor locations. Sound proof with active ventilation. Cosy, dry hotel lounge, ideal to complement existing hotels or hostels. Heatable, insulated, transportable, individual fittings available. Equipped with active ventilation, and optional roof terrace. Ideal for events, touristic destinations and innovative housing areas. Fully brandable in all RAL colours and with partial or full plots. Manufactured from one piece, suitable all year round. No base or recruitment required. Many special features, customized furniture and coatings available. Modular hostel from a minimum of twelve double-room units. Can be stacked 2-high, set-up takes only a few hours. Sound proof, insulated, heatable, with active ventilation,.